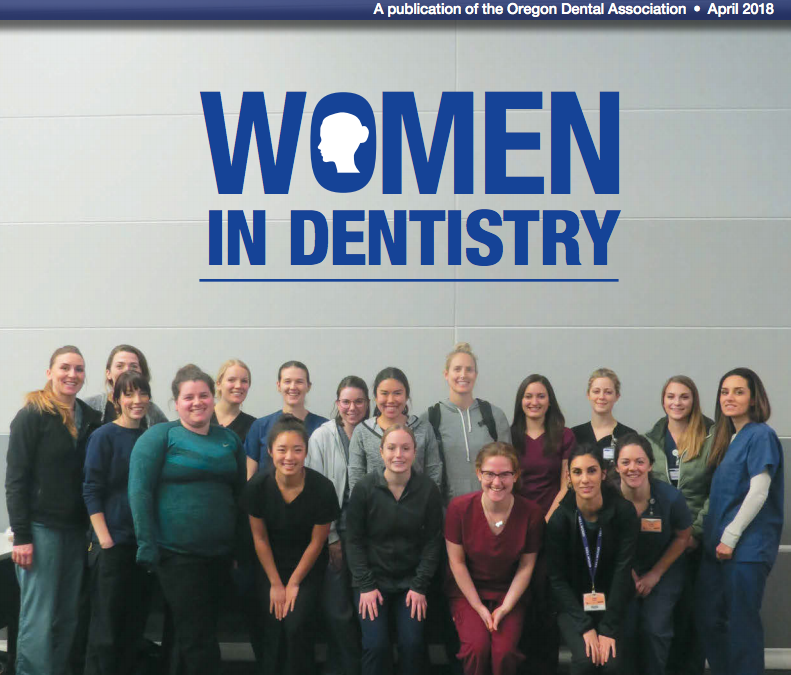 The following article was published in the April, 2018 edition of Oregon Dental Association Membership Matters article on Women in Dentistry. Dr. Baarstad knew she wanted a career in the medical field, and she initially studied pre-med at the University of Oregon. The cost was mounting, however, and financial aid was limited. She spent some time at Lane Community College exploring her options for careers that would be more cost-effective and get her into the workforce sooner. In 1987, at the age of 19, she began working as a dental assistant. It wasn’t long before Dr. Baarstad became intrigued about becoming a dentist. “I looked across the chair and I thought, ‘I could do that.’ I spoke to my boss, who told me, ‘You’ll need $50,000 in the bank,’ which was absolutely not true, but I had no reason to not accept that as truth, so I put it out of my mind,” she says. At the age of 26, Dr. Baarstad divorced and returned to her dream of becoming a dentist. As a single mother, she could not give her two small children the life she wanted for them on a dental assistant’s salary. She was accepted into the Oregon Health & Science University School of Dentistry and earned her DMD in 2001. She now leads a staff of 12 people in two dental offices, 11 of whom are women. She says establishing her own practice allows her to have both a rewarding career and a fulfilling personal life. She notes that she enjoys serving as a mentor to her employees and helping them grow in their professions. She strives to provide great benefits and a healthy work environment because she was an employee and knows what it means to be appreciated, supported and compensated well. She describes the group as more like family than co-workers. They do regular staff meetings, team-building exercises and retreats. Recently, the group spent a Friday team building, talking and making art together at a glass fusing shop. Dr. Baarstad says her work also gives her the opportunity to make a difference in her patients’ lives. She has seen people with severe dental anxiety begin to relax during their appointments and others, including recovering drug addicts, who initially had significant dental problems no longer be embarrassed about the condition of their mouth. “It’s a great feeling to take somebody with a significant dental disease — someone who is in pain, can’t chew, is embarrassed of their smile or all of the above — and turn that around for them. To see them regain their self-esteem or advance their career is a wonderful thing to be part of. Sometimes, dentistry can be life changing,” she says. Dr. Baarstad says that while the percentage of women in her graduating class in dental school was small and less than 20 of the practicing dentists in Lane County are women, she sees positive gains being made by women in the industry. “When I was in dental school, I had two men directly tell me I should not be there. I was taking a man’s space and a man’s job, and I wasn’t going to end up practicing full time anyway so I was just wasting resources. It was very offensive. I think that’s gotten much better,” she says. She recalls referring a patient she suspected had cancer to a male oral surgeon, who dismissed her concerns and responded as though she were overreacting. When she continued pushing for tests over the next six months, the results showed that the patient did indeed have oral cancer. He died two years later. For example, Dr. Baarstad says she believes women tend to think more about support positions in dentistry rather than becoming the dentist because of social norms and pressures. She has had many young men and women shadow her at the office because they are thinking of a career in dentistry.